Last night, I got home late and went to check on my kids. Of course, two of them were still awake. I was exhausted, but I kicked off my shoes and crawled into bed with my daughter for a few minutes. We chatted about her day and talked about tomorrow. We giggled and made plans and talked about her new friends. This is such a sweet and simple way to connect with her. I kissed her and hugged her one last time and headed into my son. So I crawled into bed with him and we talked and whispered and giggled. I gave him another hug and kiss and wished him sweet dreams. I was halfway down the stairs, heading to my pajamas and some much needed “me” time when I heard it. “Me too?” cried the other little voice from his bed. My initial thought was I just gave you one more kiss. I just gave you one more hug. I’m tired. I’m already halfway down the stairs. The day is done. Good night. All those thoughts went through my mind before I answered the request. Because a friend of mine just told me a few days ago that her teenage daughter doesn’t hug her anymore. Ever. 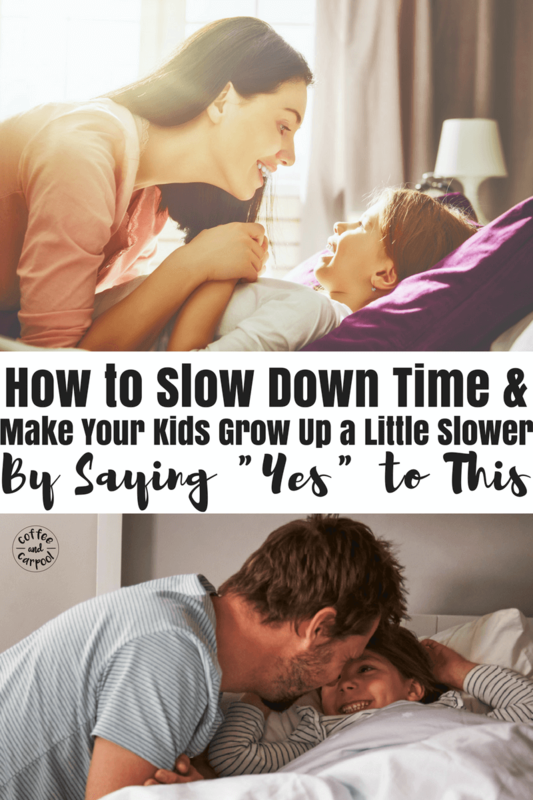 I’ve always known that when our kids hit a “last milestone“- the last time they breastfeed, the last time you carry them to bed, the last time they ask you for one more hug and kiss- it might not get noticed. I don’t carry my eldest to bed anymore. But when was the last time I did it? I have no clue because I didn’t know to pay attention to it. That last milestone moment didn’t get noticed because we rarely know it’s happening for the last time. As a mom, I know my kids are going to grow up and not need me and my hugs and kisses as much as they do now. So while I know there may come a time when my kids stop asking me for more snuggles and more hugs and more kisses, it feels so far off for me. It feels like I have plenty more nights to give extra kisses and hugs so it’s okay to pass on this. But remembering what my friend told me hit a little too close to home. It was a little too real. My kids are growing up fast and I often wish I could slow it all down. I reminisce about the toddler days and the preschool days and even the up all night, hold them swaddled in my arm days. But since there’s no magic way to literally slow down time, I had to find another way. Staying in the moment, purposefully enjoying each tiny parenting moment is the secret. It’s the one thing that slows down time for me. I pause time when I take a second to focus on what’s right in front of me, rather than thinking forward to my looming to-do list or the loads of laundry waiting, or mentally figuring out tomorrow’s carpool schedule. So as tired as I was, and as halfway down the stairs as I was, I walked back up and gave them each one more kiss and one more hug. I paused time. And in that moment I helped my kids grow up a little slower. Kissing each one of them again slowed down their childhoods, just for a moment. And it reminded me what’s really important. Because I know they’ll still ask me tomorrow for the love. And probably the day after that too. But one day, I might not get the request. And it’ll break my heart. 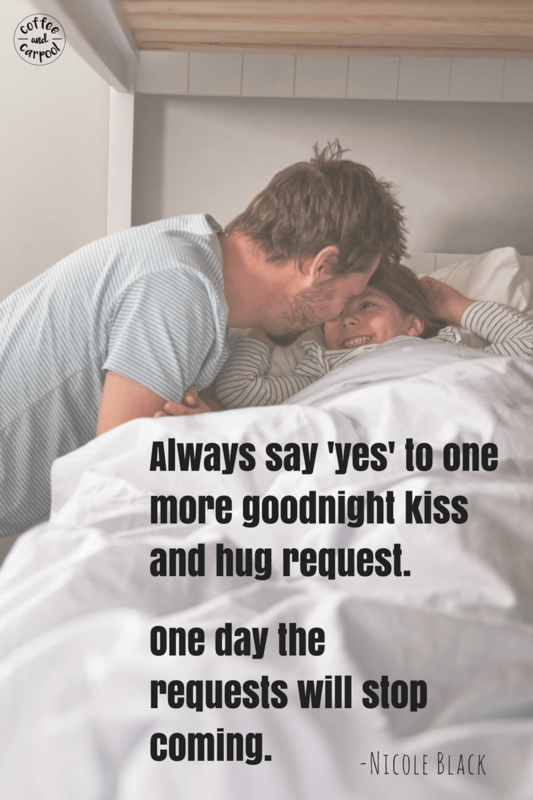 But when they’re teenagers and no longer requesting one more hug and kiss to prolong their bedtimes, I’ll have the memory that when they asked, at least for that night, I had the wherewithal and patience to pause time and climb the stairs, to give out one more hug and one more kiss. 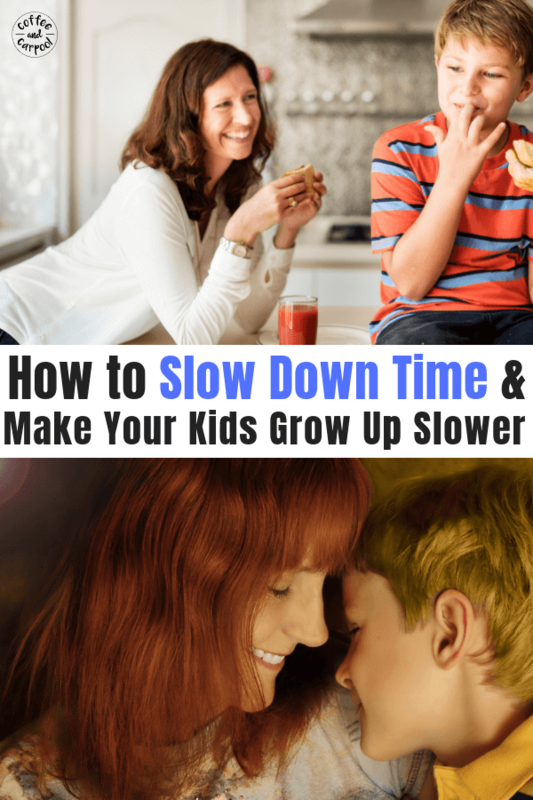 What important things do you do to pause and slow down time? Click below and let me know! Want more Positive Parenting Resources? 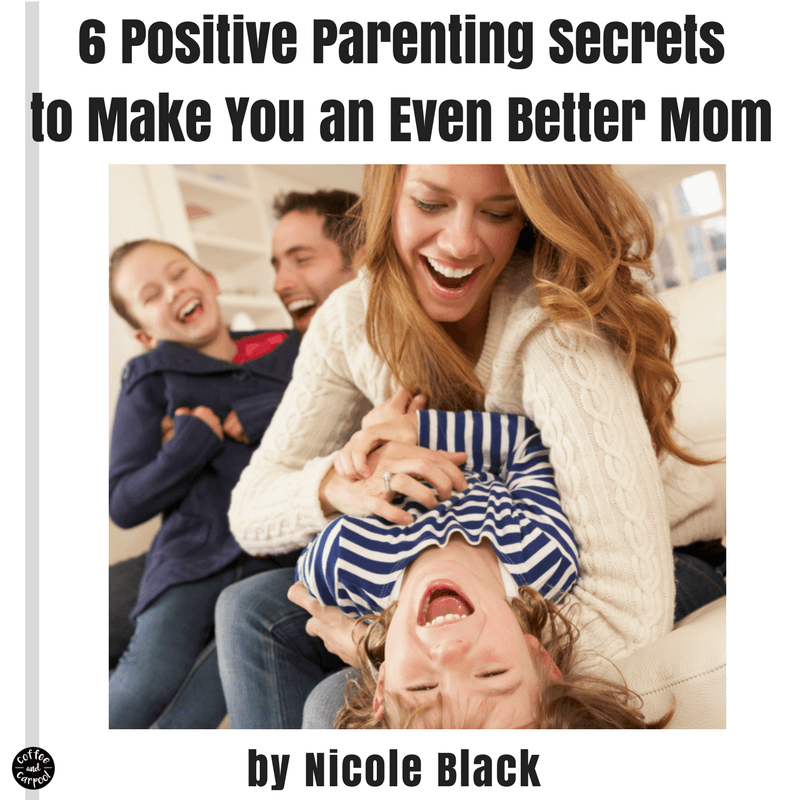 Click here for our ebook with 6 Positive Parenting Secrets! This is so true! Makes me want to cry. My kids are teens now and for now they still want my husband and I to snuggle up and talk about their day. I hope it never ends, but I know it will one day. But until then, I’m gonna soak it up. This is so sweet and true. My 7 year old loves to call for more hugs when it’s bed time. Usually either my husband or I go because I think deep down we know soon enough he’ll be a teenager and we’ll be lucky to give him a fist pump lol. Wow! Thank you for this. My bonding time with my just turned 13 son is bedtime. We chat about his day, good and bad and he asks about my day. We have a snuggle and I leave him to sleep knowing we are both ok. It is very special as I know soon enough he wont want this anymore. Thank you because i have been criticised for doing so. Oh I’m so sorry you’ve been criticized for it. That’s ridiculous! It sounds like a really special time for you and your son! Good for you for keeping it up! I can’t believe someone would criticise you for this. It’s so beautiful! I snuggle with my 7 year old every night to put him to sleep and I hope he will still want to at 13…it’s such a special time together. I’m so glad I’m not the only one who does what you do. I am a grandma raising my granddaughter from birth. My husband and I adopted her. She is 6 yrs old and still wants me to snuggle with her at bedtime till she falls asleep and we also talk about her day and even our day when spent together. She sometimes talks about when she goes to college…lol. I tell her please be a kid for as long as you can. I know these days won’t last and it bothers me a lot. I think more so now bc I lost my son, her father almost 2 yrs ago. I see a lot of him in her. She’s a spitting image of him. Anyway, I just want her to stay as young as she can bc I know one day she may not want those snuggly times.